Jacob Salmen of Slidell died following a train accident near New Orleans in November of 1908. Here is some information about the man and his funeral, which was attended by hundreds in the New Orleans and surrounding business community. According to the Lumber Trade Journal of December, 1908, Jacob Salmen was a familiar presence at the office of the Salmen Brick And Lumber Company in the St. Charles hotel building on Common street in New Orleans. "He was habitually cheerful, always attentive and generally of a disposition to inspire the friendship and respect of all coming in contact with him. 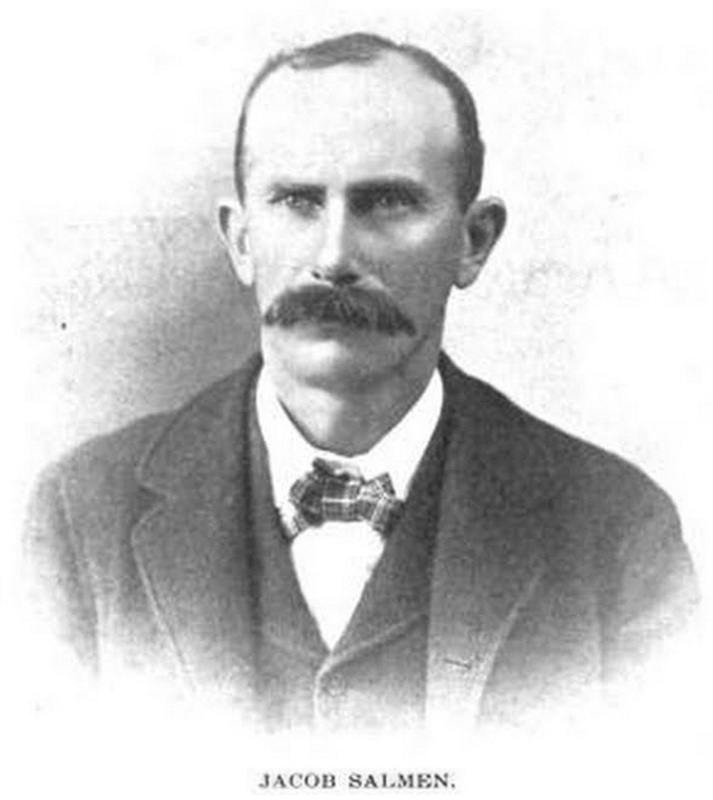 His last week's work included his presence at the conference held on November 6 to consider questions relating to Panama canal specifications, in which he served on a committee raised to formulate a standard for piling which was adopted by the conferees and Is now under consideration by the Isthmian Canal Commission. "Jacob Salmen was widely known and very warmly esteemed by a large circle of business and social friends in this section and throughout the country. He was devoted to the large business in which he was engaged, a tireless worker and of a determined disposition, although under all circumstances serenely unruffled, considerate and gracious. "He is survived by his brothers, Fritz Salmen, president, and Albert Salmen, general manager of the company. Of Swiss ancestry. Jacob Salmen was born at Handsboro. Miss., July 15, 1857. When nine years of age he was taken to Switzerland and educated. He graduated from the University of Grunau of Berne, after which, and when about 22 years of age, he returned to this country, and entered the business In which he was engaged to the last. "The company named, of which he was secretary and treasurer, took over the buslness founded by his mother and was incorporated about 1870; his father, J. F. Salmen, having died at Handsboro, in 1867. The business of the company had been successfully established by Mrs. Salmen. a very remarkably gifted business woman, and under the later management of her three sons, to each of whom she had given a liberal education, it has been prosperous in the interim. 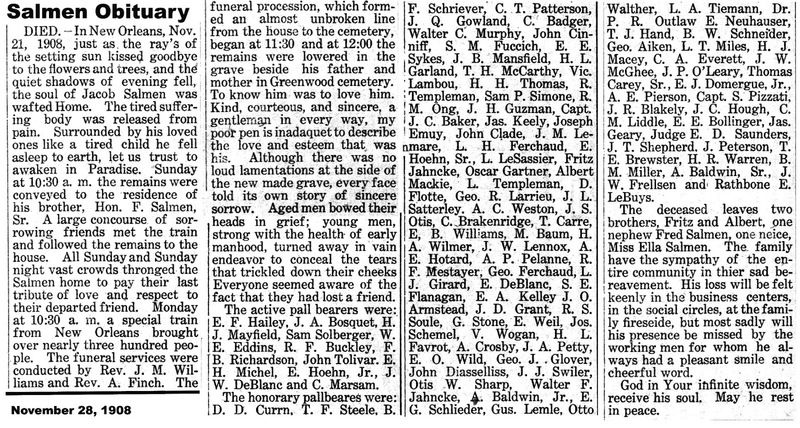 "The funeral was at Slidell on Monday morning, November 23, and was attended by a numerous assemblage of New Orleans friends conveyed thither by a special train provided by the New Orleans & Northeastern railroad for the purpose, The obsequies were at the home of his brother. Fritz Salmen, and the local attendance was also very large. "The ceremonies, conducted by Rev. J. M. Williams, of Covington. La„ and Rev. Alonzo Finch, of Slidell, were singularly impressive. Every place of business In Slidell was meanwhile closed, and It seemed as though the entire population had come out to take part in the final tribute and that each had come as one especially bereaved. The floral tributes were most profuse, and there was in It all overwhelmingly touching marks of the tenderness and respect entertained by all of Slidell for their departed friend. The body now rests In Greenwood cemetery under and surrounded by a huge bank of crushed and lifeless flowers. Besides a number of the general officers of the New Orleans & Northeastern railroad, there were several present from New Orleans' lumber and allied circles, notably Including the following: Charles J Patterson, T. H. McCarthy, Oscar Gartner, A. C Weston, J. S. Otis, C. Brakenrldge. J. Carre, E. B. Williams, A. Baldwin, Sr., A. Baldwin. Jr.. R. E. DeBuys and others." 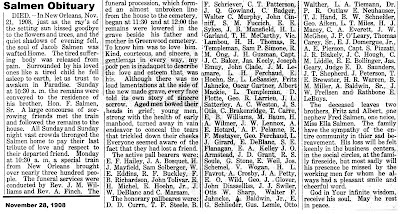 The following is the obituary for Jacob Salmen as published on November 28, 1908. Click on the image to make it larger. This is the complete account as published in the December, 1908, edition of The Lumber Trade Journal.